Jackpot: Top Non-Progressive Payout of 1500 coins. Not content to die and be reborn for over a decade, Michael Myers is back again. Believe it or not, he’s back in the new Microgaming slot game, “Halloween”, based on the iconic 1978 cult classic horror movie. 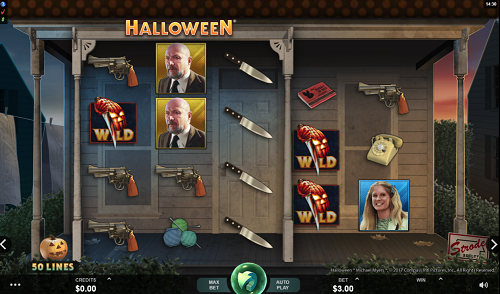 Set in an old, abandoned house, the Halloween slot keeps players biting their fingernails throughout gameplay. Myers’ presence is always felt, as he lurks in the window or stalks them inside the house. The game symbols are characters and objects that cinema fans will recognise from the movie, along with the chilling soundtrack and sound effects from the movie. As far as the whole scary atmosphere goes, this slot is absolutely spot on. With game-play substance and elegance to match its iconic movie style, Halloween is a 50 payline, 5-reel video slot that pays out a top non-progressive jackpot of 1,500 coins. In terms of Halloween’s bonus modes, it is complete with stake multipliers, jumbo blocks, a free spins feature and wandering reels. Despite the unique idea of the wandering reels, the object of the game remains the same to most online slots (i.e. match icons from left to right in order to win prizes, with three or more in a row earning a win). The Halloween online slots game can be played on mobile devices or PC desktops at Betway, Royal Vegas, Jackpot City, Spin Palace and Ruby Fortune. Audio – If you want the full movie experience, keep Halloween’s audio turned on. The soundtrack is downright creepy and features all the terrifying elements of the haunting piano tunes from the movie. Every spin is spine chillingly musically accompanied as you continue, wait and wonder when exactly the Boogeyman is going to get you. Visual – Halloween features a dark and suspenseful atmosphere, and the game’s developers have great job of transferring that spooky atmosphere onto the game screen. However, Slots can’t all be style over substance and Halloween continues to deliver on all fronts with its sweet play action. Its visuals run smoothly, elegantly and stylishly without jerking or loading issues. Of course. Its Microgaming. It just works! If you’re familiar with software by Microgaming, it won’t come as a surprise that this game is mobile friendly. The browser-based design ensures compatibility with all major mobile devices, including both iOS and Android products. As Halloween is a licensed online slot, it’s also natural that they’ve decided to make this game appeal to as wide an audience as possible, and both low limit and high limit betting levels are available as a result. Should you want to test the machine first, a play for free options is also available at many Online Casinos including Betway, Royal Vegas, Jackpot City, Spin Palace and Ruby Fortune. Wandering Reels – A feature whereby a group of three reels spin together. The Wandering Reels randomly stop in one of three positions during the game, thereby determining the reels and lines played. 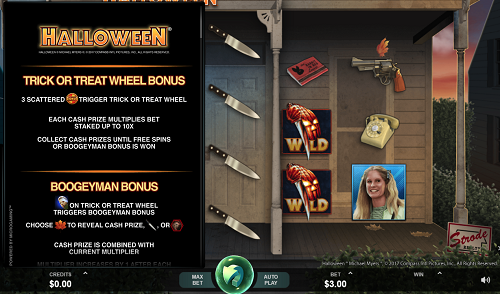 Trick or Treat Wheel Bonus – is activated when landing three bonus symbols in the game and allows players to multiply their stake with cash prizes until they get to the Boogeyman Bonus or Free Spins. Boogeyman Bonus – is a standard click-and-pick feature, in a creepy cloak. The goal is to escape the house and save yourself from the fate of Michael Myers. Along the way, you’ll be uncovering cash prizes and increasing the multiplier with each successful pick. Free Spins – When one of the movie character icons turn up in game play nine free spins are awarded and the Wandering Reels return to their locked position. Hot tip – ‘Halloween’ players are advised to set their betting range. Coin sizes range from 0.01 to 0.5 and can adjusted manually. Choosing the “Autoplay” option, players can set the number of times they wish for the reels to turn without any interruption, whilst the “Play” button is used to set reels in motion after setting your bets. The Halloween symbol can substitute for all game symbols except the Bonus Scatter. The Wandering Reel feature occurs in one of the reels between 1, 2 and 3, thereby this group of reels spins together as one. Additionally, the Wandering Reel contains Jumbo Blocks which spin in multiple reels. Landing 3 or more Bonus Scatter symbols activates the Trick or Treat Wheel feature. Players have an opportunity to grab cash prizes of up to 10x their stake. Every cash prize multiplies the bet staked up to 10x. Four main characters from the movie; Annie, Loomis, Laurie and Lynda offer the biggest payouts. Laurie is the most valuable. Hitting any of the main four characters on Trick and Treat Wheel awards a player with 9 Free Spins. If a player hits the Michael symbol on Trick or Treat Wheel, the Boogeyman Bonus is triggered. In Boogeyman Bonus mode, the player may choose between a leaf, a knife and Michael’s Head. In these cases, a cash prize is combined with a multiplier, increasing by 1 after each cash prize becomes revealed. 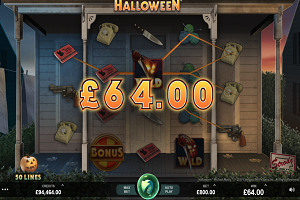 If you’re looking for a stylish slot that delivers big wins and evokes all the memories and aesthetic of an original move, then Halloween looks to have all those boxes ticked. Top marks from us. Even if you know nothing about the movie, its highly likely you’ll find Halloween a unique and fun online slot experience. The ever-changing reels are an excellently innovative idea and the bonus rounds will keep everyone entertained. If you have the time and opportunity, we definitely recommend checking Halloween sooner rather than later. You won’t be disappointed! Check it out today at one of your favourite Microgaming Casinos.